The Momentum Textiles privacy curtains add beauty to every environment. From patient rooms to exam rooms the space is made more pleasing by the pattern and color of the curtains. In some instances the privacy curtain is the only pattern in the room. Our products offer soft, organic, whimsical motifs that are inviting and soothing to both patients and their families. 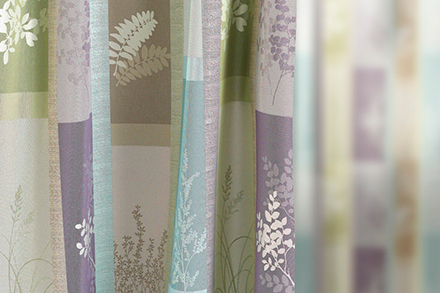 Our design team creates privacy curtains that promote the healing environment expected by healthcare specifiers today. Momentum Textiles privacy curtains have at least 50% recycled content and continue to meet all ACT performance requirements. No topical flame retardants are added to our privacy curtains. A true exploration of color transitions, this eleven color design is infused with nature inspired hues. Based on a photo by Henry Domke, this textile refreshingly contrasts its bold scale with subtle shifts and shadows. 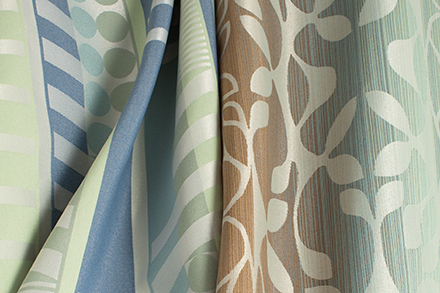 Large bands of color with feathered ikat edges form a soft rhythm punctuated by contrasting interwoven ribbons. A minimal, organic element combines with fresh colors to soothe and enhance healthcare interior spaces. Different interpretations of plants fit together to form a lattice like structure that grows up the curtain. A playful blend of geometry and texture, Freehand offers a softened modern design for all healthcare environments. Captured from beneath the branches, this design looks upward to the idea of life and new growth. 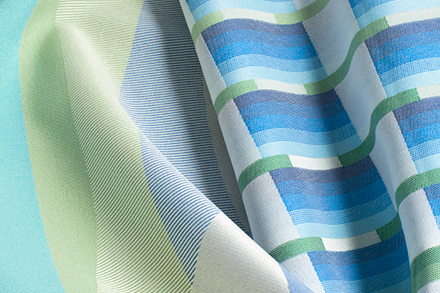 This soft geometric textile is enhanced by a multi-colored ombré and a textural weave for a clean modern look. Inspired by the arts - proven to be important for healing - Haiku emphasizes a hand painted vertical texture. Taking inspiration from the hickory tree, this design is offered in soft, natural colors. Inspired by color-blocking in fashion design, this lively and bright fabric uses both color and scale for a striking effect. Midlands is a simple clean design that offers a gentle sophistication to the patient room. 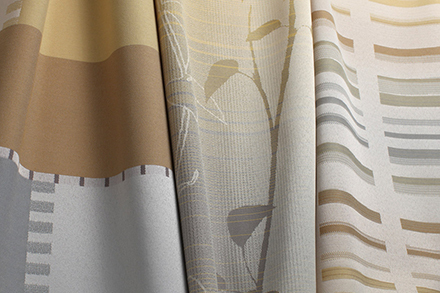 Imparting a serene landscape feel, Napa coordinates easily with other patterns yet is colorful enough on its own. This design features a thoughtful combination of Henry Domke’s photos joined to create one dynamic pattern. A mélange of natural grasses and plants decorates this inspired textile for a feeling of warmth and relaxation. Respite feels fluid and soft with a gentle ombré and uses the same modern leaf design as upholstery pattern Elle. 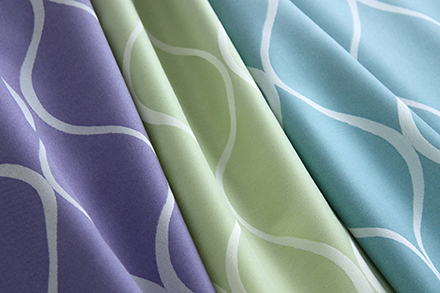 This calming and uplifting botanical pattern features bloom inspired motifs that fade in and out of linear divisions. Colorful streamers are reminiscent of the freshness and newness of the spring maypole dance festival. 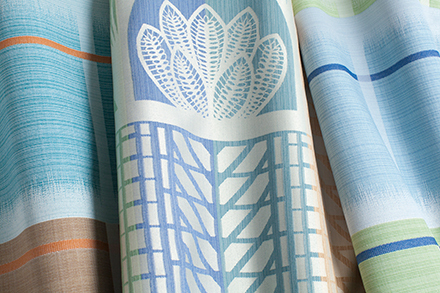 Nature inspired motifs exude a solar feel in warm colors or feel like refreshing pools of water in cool hues. This design layers brightly colored stripes with an undulating wave pattern. 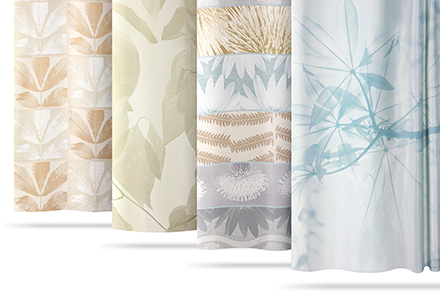 The graphic leaf design, enhanced by color and texture brings nature indoors for a pleasing and comforting effect. Designed to be dynamic in spirit, Streamers brings energy and life into the healthcare environment. The calming leaf motif, softened by a gentle ombré in the background exudes a natural airiness and relaxing rhythm. With a nod toward the Bauhaus movement, Waypoint is defined by clean geometric forms and visual balance.